Mad God preach supreme grooves and dark imagery that would make the Old Testament clutch pearls. A potential doom monster is born with Grotesque and Inexorable. ‘We worship the Mad God and pray he will bring Doom to all‘. This is the only sentence that fills the About space on Mad God‘s Facebook page. Really, it’s all you need to know; the South African trio’s purpose proves to be as straightforward as a nigh religious worship of doom and its tenets. With a loving nod in Lovecraft’s direction, they set out to stand above their peers in a crowded doom market and succeed with only very minor setbacks. In a premiere article I wrote for the track “I Created God”, I said ‘You know those ‘(slow heavy metal music playing)‘ memes you probably see everywhere? This is the music I imagine is playing when I see those’. Well, Grotesque and Inexorable is that times six. You know, because there’s six tracks here. Seriously though, the music here is just nastily heavy and groovy. There’s some 70s proto-doom lurching, progressive transitions, and tinges of psychedelic rock that add a little color to the album’s dark palate. The album has a depraved feeling to it. Listening to the lyrics alone firmly cements this feeling into the DNA of the music. “I Created God” reads like true crime testimony used in the case against Charles Manson (the song is inspired by the horrendous cult leader and murderer, so it’s not just a comparison). “The DeZalze Horror” is a direct reference to the mass killing of the Van Breda family at the De Zalze Golf Estate in Stellenbosch, South Africa. The instrumentation is just as weighty as the very violent and deviant themes the tracks take on. Every frayed crackle is picked up by the amps. Every riff is crispy and crunchy. It sounds so good. Grooves are bountiful in every song, with standouts being the main riffs in “Haunting the Graves of the Unhallowed” and “I Created God”. Drums are snappy; they plod along so well. The bass is a very low, consistent rumble along with the guitars. I imagine with good sound systems, the floor would vibrate beneath your feet as if the tendrils of a Great Old One threatened to burst forth. The band also uses a lot of vocal samples from interviews and movies to set tones. It’s fine enough at first and deciphering them through the unrelenting guitar fuzz is fun, but they’re in all six tracks. Some may interpret this as an over-reliance on these elements and I’d be hard-pressed to disagree for the most part. Their music can clearly speak for itself, and I imagine many other doom fans that let Mad God into their lives would feel similarly. Speaking of vocals, they are the most diverse element of Grotesque and Inexorable. Nearly every song employs a new technique from the last. “Haunting the Graves of the Unhallowed” has a spacey and wobbly effect to singing that is mostly mid-range with some highs for the chorus. “The Crawling Chaos” has multilayering that creates a ghostly tone to the vocals. “The Hunt Begins” is the cleanest the vocals get, unimpeded by any post-production effects; it makes for an eerily personal close to the album which is otherwise very alienating and repelling (but, you know, in a good way). 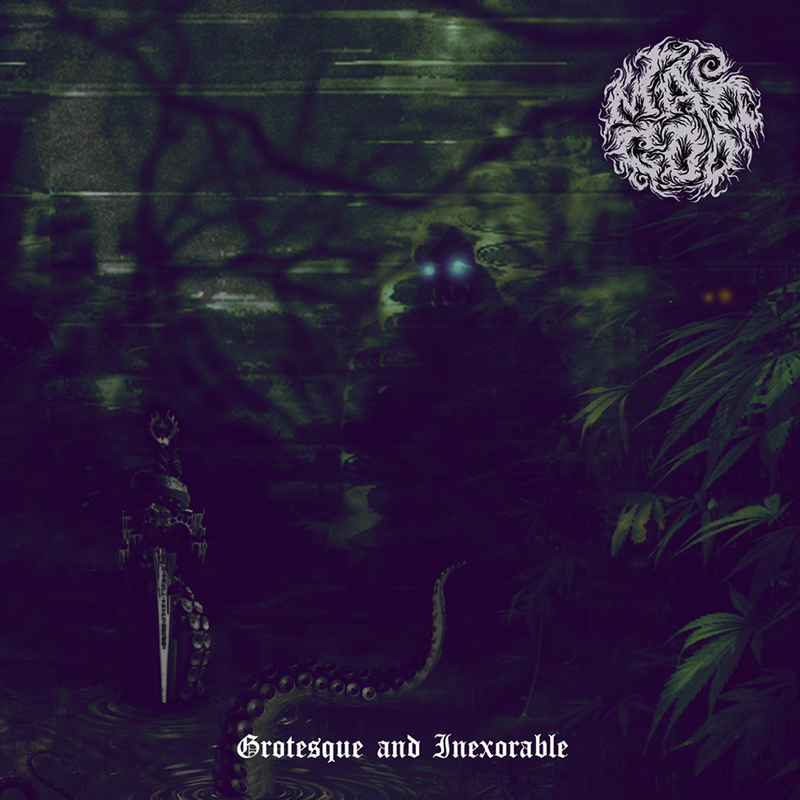 Mad God are, indeed, grotesque on this album. Whether they can take this momentum and become inexorable remains to be seen, but the groundwork has been laid for a hostile possession of the international doom scene. Don’t sleep on this if you like your metal denser than hell, Vantablack dark, and bloodier than a rare steak. Previous PostJan Felix May - "Red Messiah"
Next PostAgrypnie - "Grenzgänger / Pavor Nocturnus"